Your choice of red hot sauce, barbeque sauce, honey mustard, ranch or blue cheese dressing. All wings. Wing dings with special hot sauce. Served with onion, tomato, jalapeno peppers & cheese. This Italian favorite is golden fried & served with your choice of ranch dressing or marinara sauce. Tender white chicken breast meat lightly breaded & golden fried. Served with ranch dressing or barbeque sauce. Your choice of our house fried mushrooms or cauliflower. Served with ranch dressing. Served with cheese sauce or honey mustard. Mushrooms, cauliflower & mozzarella sticks, hot popper cheese balls & poppers served with ranch dressing. American than they are french. Your choice of plain or seasoned. These little amigos are so good you’ll wish they were bigger! Served with salsa & sour cream. Thin sliced Idaho potatoes flash fries with seasoning salt. Add french onion dip for $0.50. Our onion rings are golden fried & simply delicious. Don’t forget to eat the skin! These potatoes come with melted cheese & bacon. Served with sour cream. Golden fried cheese with a Jalapeno Pepper Zing! Golden fried hot pepper cheese balls guaranteed to get your attention. Served with ranch dressing. Chili at its finest. Just the right spice, & full of hearty ground round. With onions, cheese & sour cream. All of our specialty soups are home made daily. This classic mix of fresh lettuce, turkey, ham, hard boiled egg, tomato, swiss cheese, American cheese with your choice of dressing. Garlic toast included. One size only. chicken breast, tomatoes, hard boiled egg, cucumber, American cheese, swiss cheese and your choice of dressing. Garlic bread included. One size only. Generous portion of lettuce, cherries, bacon, tomatoes, onions, cheddar cheese, blue cheese, walnuts and raspberry vinaigrette dressing. One size only. Tossed garden greens, tomato slices, greek olives, beets, onions, green olives & feta cheese topped with our home made greek dressing. Named in honor of our only greek waitress. Grilled Pita included. One size only. cheese, garlic croutons, & caesar dressing. Garlic bread included. One size only. Tossed garden greens, cucumber slices & tomato topped with your choice of dressing. Fresh shredded cabbage with a creamy dressing. All burgers 1/3 lb. ground round Black Angus. The best burger in town! *Jumbo any burger to a 2/3 pounder for only $2.00 extra! Add a pretzel roll for only $1.00 extra! Our famous 1/3 lb. ground round char-flamed, with french fries, & a shell of domestic beer or soda. No refills on beer and 1 only on soda. Includes pickle & onion. Cheese, lettuce, & tomato extra. 1/3 lb. ground round char-flamed to order with onion & pickle on a sesame seed bun. Our 1/3 lb. classic burger with lettuce, tomato, onion, pickles, mayo and American cheese. Our 1/3 lb. specialty sandwich with 2 burgers, shredded lettuce, 2 slices of American cheese & thousand island dressing. On 3 layers of bun. 1/2 ground round stuffed with cheddar cheese on a sesame bun. 1/3 ib. ground round with two slices of American cheese, bacon & egg on a sesame bun. Our 1/3 lb. classic burger with delicious blue cheese. Our 1/3 lb. classic burger on grilled rye with melted swiss cheese, onion & pickle spear. Our 1/3 lb. classic burger with sauteed mushrooms & swiss cheese. A burger that is incredible. 1/3 ib. ground turkey breast on a sesame bun. Hamburger with sauted onions, green pepper, mushrooms & provolone cheese on a bun. Hot as hell burger! Hamburger with sauted jalapenos, salsa, shredded lettuce, pepper jack cheese & chipotle mayo. Hamburger with ham, pineapple ring, teriyaki glaze & swiss cheese. Our 1/3 lb. classic burger with ham, swiss cheese & bacon on a sesame seed bun. You will love this one, or else! 1/3 lb. charbroiled ground round with American and swiss cheeses, on buttery sourdough with our thousand island sauce. NEW! 1/3 Lb. Ground round with monterey jack cheese, alfalfa sprouts, guacamole,tomato, red onion and garlic lemon aioli on a sesame seed bun. 1/3 lb. charbroiled ground round, crispy bacon, melted pepper jack cheese, fried onion rings, tomato, lettuce and Sweet Baby Ray’s® BBQ Sauce piled between two slices of thick texas toast. Giddy up! Our 1/3 lb. classic burger patty with cottage cheese, lettuce, tomato & cucumber. Chicken breast with cottage cheese, lettuce, tomato & cucumber. Tuna with cottage cheese, lettuce, tomato & cucumber. 100% organic vegetable patty with lettuce, tomato, onion & choice of cheese on sesame seed bun. Less fat and cholesterol than skinless chicken. Naturally juicy and tender. Better Beef, Piedmontese Beef, USDA Certified Beef. 1/3 lb. ground round char-flamed to order with onion & pickle on a sesame seed bun. 1/2 lb. of sliced corned beef piled high with swiss cheese, sauerkraut on grilled rye. Sliced turkey piled high with swiss cheese & coleslaw on grilled rye. This is Lee Ann’s favorite! 1/2 lb. of sliced corned beef piled high with swiss cheese on your choice of bread. Our famous grilled ham piled high with swiss cheese, lettuce, tomato, & tartar sauce on a specialty bun. Named after one of our favorite patrons. Crisp fried bacon, tomato, lettuce & mayo on a bread of your choice. Our boneless, marinated chicken breast is grilled & topped with lettuce, tomato & mayo on a sesame seed bun. Add cheese for $0.50. Golden brown chicken tenderloins topped with swiss & American cheese, ranch dressing & served on a grilled pita with shredded lettuce & tomato. A delicious 8oz. U.S.D.A. choice strip steak cooked to order with lettuce & tomato served on a specialty bun. Served with french fries, coleslaw or cottage cheese. tomato on your choice of bread. Our famous grilled ham with your choice of cheese and bread. Our famous ham, turkey, crisp bacon, swiss cheese, lettuce, tomato & mayo on three layers of bread. NEW! Sabby’s steaks are U.S.D.A. Choice Beef. They are hand cut and aged until tender. We char grill each steak to your specifications. Served with your choice of potato, or onion rings and small dinner salad or coleslaw. 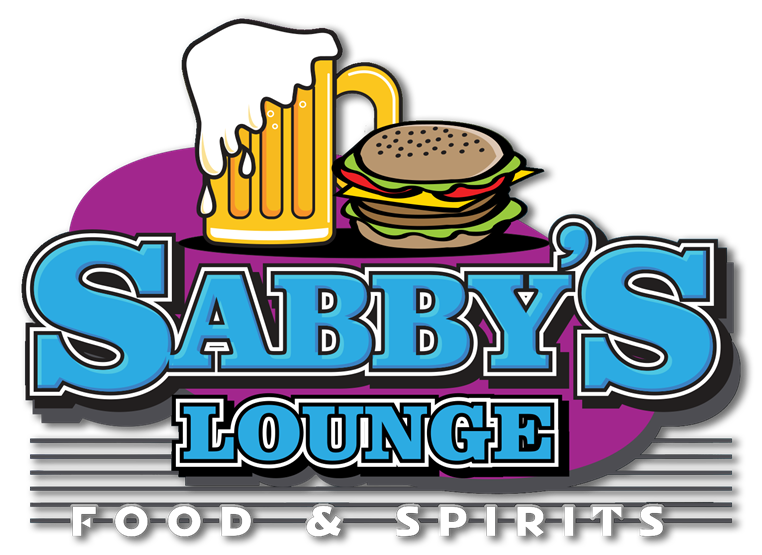 Sabby’s steaks are U.S.D.A. Choice Beef. They are hand cut and aged until tender. We char grill each steak to your specifications. Served with your choice of potato, or onion rings and small dinner salad or coleslaw. St. Louis style ribs slow roasted until tender. Finished on our char grill with a special barbeque sauce. not frozen. Served with coleslaw & fries. Fresh lake perch platter to share. (just perch). Lake perch with fries on a specialty bun. 3 pieces of premium Icelandic Cod loin, fries, & coleslaw. A generous 1/2 lb. of beer battered jumbo shrimp, fries & coleslaw. Basket of popcorn shrimp and fries. *Cooked to order. Consuming raw or undercooked meats may increase your risk of foodborne illness.